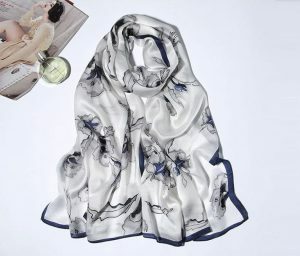 FEATURES Selected Hangzhou silk, soft and skin-friendly, breathable and moisture-absorbing, comfortable to wear. 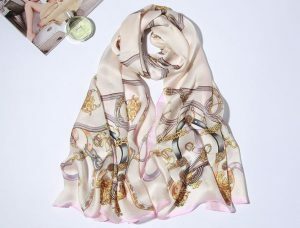 Exquisite machine curling, no jump stitches, no drop, not easy to hook up, the details reflect the high-end quality of this scarf. Color-blocking prints, color matching does not conflict, more eye-catching, more versatile. This scarf is medium-thick and can be worn all year round. 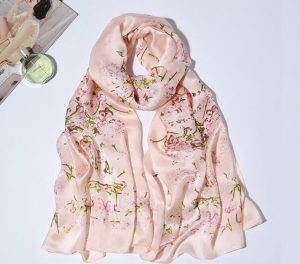 Wearing in spring and autumn can resist the cold wind and warm the neck. It can be worn during the summer and the sun protection effect is good. It can also be used as a shawl in an air-conditioned room to protect the shoulders and neck from cold. 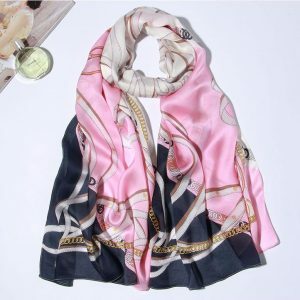 In winter, you can wear a silk scarf and then wear a wool scarf to give you a double warmth.